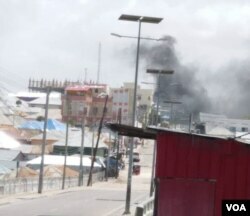 More than 15 people have been killed and more than two dozen others were wounded in two assaults Saturday on the compound of Somalia's interior and security ministries in capital city Mogadishu, according to witnesses. The first attack began when gunmen set off huge explosions outside the main gate of the interior ministry building before three militants stormed it. Smoke was seen rising above the scene. Witnesses said the security forces launched a counterterror operation and engaged in an hour-long battle with the militants before ending the siege and killing all the three armed attackers. Witnesses said government workers were among those killed in the first attack. "I have seen with my eyes at least 10 dead bodies lying inside the compound" a female witness told VOA. Speaking to reporters, the Somali Information Minister Dahir Mohamud Geelle said the militants carried out today's attacks to kill and maim civilians. "They killed and wounded a number of people who were inside the compound, but the security forces engaged with the militants and killed all the terrorist," Geelle said. The minister declined to say how many people were killed in the attacks. An official who asked not to be named, though, said the death toll could rise as authorities sort through the building, the exterior compound and at a police building across from the interior and security ministries. Dozens of people trapped in the building during the battle were rescued during the operation, while others escaped by leaping from the windows. Abdinasir Said Muse, the deputy minister of security, was among those rescued from the compound. The compound, which is located in one of the busiest areas in Mogadishu, is close to the parliament headquarters and the presidential palace. The second blast occurred at a police building opposite the interior ministry compound. Abdulkadir Abdirahman Aden, head of the Amin ambulance service, said his team carried five dead bodies and more than 17 wounded people from near the scene. Somalia's al-Shabab terror group has claimed responsibility for the attacks. Meanwhile, in a separate attack, a former commissioner of the Qoryooley district in the Lower Shabelle region was killed Saturday in a roadside bomb attack. Osman Sheikh Ali was killed near Baraawe town, while three others also were wounded in the attack. Al-Shabab also has claimed responsibility for this attack.